But the good news is, my Dad was accepted into a research protocol at the NIH's National Cancer Institute. And because of the research my Dad participated in, not only was he part of helping doctor's move one step closer to a cure, but as of March 13, 2014, his doctors declared him CURED, the word every cancer patient wants to hear! Thanks to amazing cancer research that WORKS (support it on this page!) and amazing medical care, and amazing family & friends...progress is being made! Plus, my Mom, Mary Ann Zavadowski, is also a breast cancer survivor. Thanks to cutting edge medical science, she is now celebrating her 16th year cancer-free. And we have THREE other awesome cancer surviors on our team, a family member who beat prostate cancer, another team member who is alive today because of a miracle "pill a day" blood cancer treatment (a treatment funded by the Leukemia & Lymphoma Society! ), and another team member who beat blood cancer. Unfortunately, we also have several team members and supporters of our team who also lost loved ones to this terrible disease. We carry gold lanterns in their honor when we walk so that we may never forget those who made the ultimate sacrifice in this battle. Truth is, we've all been touched my cancer in some way, and the fight against cancer is still raging on. Which is why we're asking for YOUR help to make sure this valuable research continues, and to celebrate this important milestone for our family and friends! That's why this year we're again fundraising as a team for the "Light the Night" walks - the Leukemia & Lymphoma Society's annual evening walk and fundraising event to pay tribute and bring hope to those battling cancer. To date, we've raised over $194,000! For the last seven years, we've been one of the top family & friends team for our entire region, and this year, with YOUR help, we're doing it again -- and joining in with hundreds of thousands of others around the globe to raise funds for lifesaving research and patient services! Please click on a team member's name on the right-hand side and then click "Donate Now" on that team member's page. ANY amount makes a difference, and you'll join hundreds of thousands of people supporting this all-important event! OR, if you'd like to join us for the Walk on October 20 in Washington, DC and be part of a special team, click "WALK WITH US" at the top of the page! 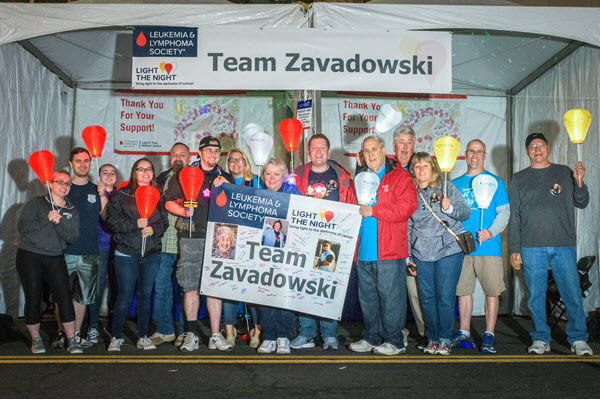 Please make a donation to support our team's participation in the Light The Night Walk and help save lives. Be sure to check my Web site frequently to see our progress, and thanks for your support!